60-megawatt (AC) solar facility to be built near Monroe, N.C.
15.4-megawatt solar facility to be built in Mocksville, N.C.
CHARLOTTE, N.C. -- Duke Energy continues to advance solar energy in North Carolina with a proposal for two solar projects that will significantly increase the regulated company's owned solar capacity in the state. "As part of our solar expansion efforts in North Carolina, we will continue to seize opportunities to both develop as well as purchase projects that enable us to deliver more renewable energy to our customers," said Rob Caldwell, senior vice president, Distributed Energy Resources. Pending approval from the North Carolina Utilities Commission (NCUC), the company will build two projects that will total more than 75 megawatts. The 60-megawatt Monroe Solar Facility on 2272 S. Rocky River Road near Monroe in Union County will be located on a 400-acre site. Strata Solar in Chapel Hill will design and build the project. The 15.4-megawatt Mocksville Solar Facility in Davie County will use about 110 acres of land. The project will be located at 197 Crawford Road in Mocksville. Crowder Construction in Charlotte will serve as the project engineering, procurement and construction lead. The company has requested a transfer of the Mocksville Solar Facility's Certificate of Public Convenience and Necessity from the NCUC, and plans to do the same regarding the Monroe Solar Facility. If approved, both projects will begin construction in March, with completion targeted for the end of 2016. Both projects will be owned and operated by Duke Energy Carolinas and will help meet North Carolina's Renewable Energy Portfolio Standard. Financial details are not being released. Duke Energy continues to invest heavily in solar energy in North Carolina as part of its effort to deliver increasingly clean energy to its customers. 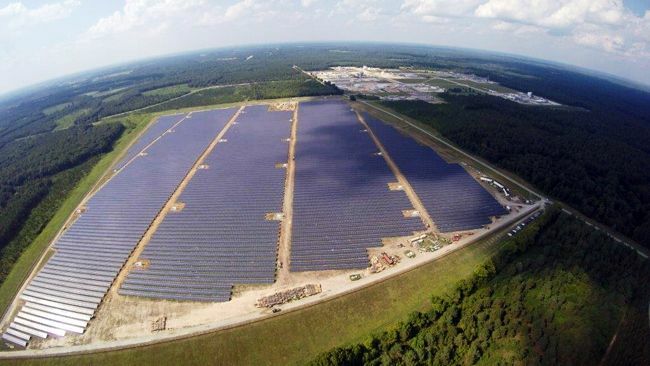 The company is currently completing construction of 140 megawatts of capacity at four major solar facilities in the North Carolina counties of Bladen, Duplin, Onslow and Wilson counties. The aggressive expansion by Duke Energy companies has led North Carolina to be ranked fourth nationally for overall installed solar. Over the past eight years, Duke Energy, through its regulated and commercial businesses, has invested more than $4 billion in wind and solar facilities in 12 states. The company plans to invest about $3 billion in renewable energy over the next five years. One megawatt of large-scale solar is equivalent to about 200 typical residential rooftop systems. The number varies by state and conditions.